This glass to ground modern greenhouse design is available in 6ft, 8ft and 10ft wide options with length to suit. Its available in a range of colours and is glazed in tempered safety glass. It’s also available in a planthouse style. The aesthetics of a porch without the extended entrance. The new Hartley Planthouse is a free standing structure. Buying a greenhouse or glasshouse can raise a lot of questions and it’s important to get the some advice from the experts. There are many makes and models of greenhouses for sale online. At Hartley we can offer you custom advice tailor suited to your location, climate, budget and growing requirements. From bespoke greenhouses and canopies to our space saving Patio Glasshouses, all our products are made in England and represent the very best in quality and endurance. 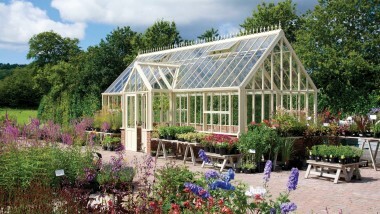 Choose from our different Glasshouses ranges – Victorian, Heritage and Modern. We also have an exciting selection of bespoke greenhouses available in a number of different widths and lengths. If you are looking for greenhouse accessories to furnish and equip your gardening space, we also stock a number of optional greenhouse accessories like grow lights, staging, shelving, greenhouse heaters and vine supports. We also offer retractable roller shades to protect plants from too much sunlight and a selection of ventilation options for all your pots and plants. A beautiful finishing touch to your structure, usually combined with matching cast aluminium finials. A classic design, echoing original Victorian style, to achieve a subtle, understated finish. Inspired by the Edwardian era, these solid cast aluminium finials create an interesting alternative to the Victorian design. Splash water proof greenhouse heater specifically for the greenhouse environment. The wide range of Hartley accessories for your greenhouse, or glasshouse. Usually fitted in sets at the eaves and ridge of your greenhouse. Produced as either a visibility light, or specifically for growth promotion. Add an extra touch of the traditional to your glasshouse with these cast vent levers. A temperature sensitive mechanism designed to regulate internal temperature. 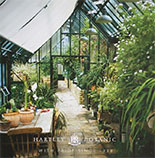 Hartley Botanic Victorian Roller Blinds for your greenhouse, or glasshouse. Included as standard fittings in our Victorian and Landscape range, these robust and dependable mechanisms can be adjusted to suit the amount of ventilation required and locked into both the open and closed positions. A Hartley potting bench, the perfect accessory for your greenhouse, or glasshouse. Premium quality aluminium staging and shelving for your greenhouse, or glasshouse. A substantial in the walled garden of a large country estate. From the essential simplicity of the Victorian Classic, to the spacious ambiance of the Victorian Grand Lodge, the range provides for the most exacting needs of gardens large or small. Extra lower level ventilation designed to increase air movement. We have always pushed the boundaries of greenhouse design creating striking structures with a contemporary feel. This glass to ground glasshouse has been designed specifically to suit the ever increasing needs of both the novice and experienced greenhouse grower. A bespoke Victorian Lodge with two porch entrances in Olive Leaf. This octagonal greenhouse is the perfect size for gardens with limited space. This modern Opus glasshouse is minimalist and extends the sought after feeling of light and space. The Architectural Glasshouse range, designed by Hartley Botanic, aims to reconnect people with nature. Superior specification sets this glasshouse apart from all others. A bespoke multi-faceted glasshouse abutting a period property.